All spiders except those in the families Uloboridae and Holarchaeidae, and in the suborder Mesothelae) (together about 350 species) can inject venom to protect themselves or to kill and liquify prey. Only about 200 species, however, have bites that can pose health problems to humans. Many larger species' bites may be painful, but will not produce lasting health concerns. In 1973 Skylab 3 took 2 spiders into space to test their web-spinning capability in zero-gravity. Many other groups spin webs in a variety of structural styles. Some (the Linyphiidae) make various forms of bowl- or dome-shaped webs with or without a flat sheet or a tangled web above or below. Some make a flat platform extending from a funnel-shaped retreat, with generally a tangle of silk above the web. The common northern hemisphere 'funnel-web', 'house' or 'grass' spiders are only superficially similar to the notorious Sydney funnel-web spider, and are generally considered to be quite harmless. Some of the more primitive group Atypidae may make tubular webs up the base of trees, from inside which they bite insects that land on the webbing. These spiders look quite ferocious, but are not generally considered to be particularly dangerous to humans. 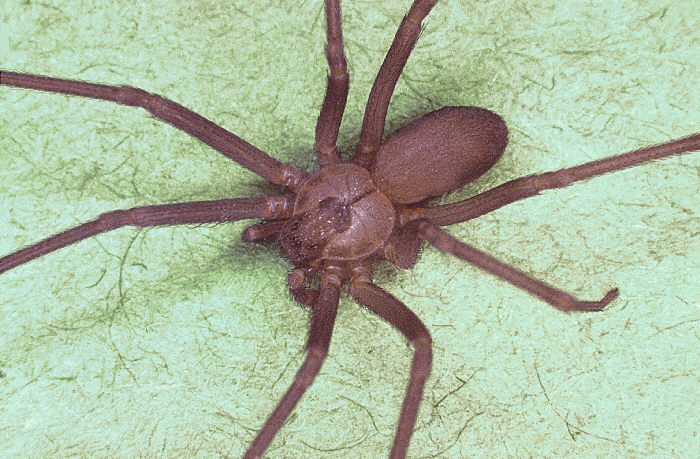 The brown recluse spider is a venomous spider, Loxosceles reclusa, of the family Sicariidae (formerly of the family Loxoscelidae). It is usually between ¼ and ¾ inch (6-20mm) but may grow larger. It is brown and usually has markings on the dorsal side of its cephalothorax, with a black line coming from it that looks like a violin with the neck of the violin pointing to the rear of the spider, resulting in the nickname "fiddleback spider" or "violin spider". Coloring varies from light tan to brown and the violin marking may not be visible. Since the "violin pattern" is not diagnostic, and other spiders may have similar marking (i.e. cellar spiders (Pholcidae family) and pirate spiders (Mimetidae family)), for purposes of identification it is far more important to examine the eyes. Differing from most spiders, which have 8 eyes, recluse spiders have 6 eyes arranged in pairs (dyads) with one median pair and 2 lateral pairs. Only a few other spiders have 3 pairs of eyes arranged this way (e.g., scytodids), and recluses can be distinguished from these as recluse abdomens have no coloration pattern nor do their legs, which also lack spines. Recluse spiders build irregular webs that frequently include a shelter consisting of disorderly threads. These spiders frequently build their webs in woodpiles and sheds, closets, garages, and other places that are dry and generally undisturbed. Unlike most web weavers, they leave these webs at night to hunt. Males will move around more when hunting while females don't usually stray far from their web.